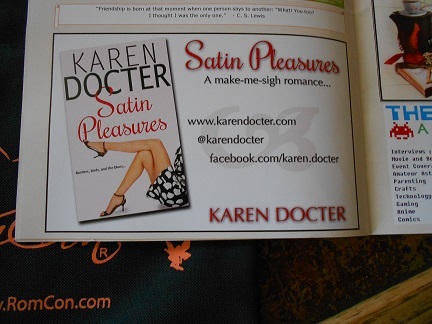 Karen’s Killer Diary Drop-In ~ 06-25-13 ~ …And We’re Off To RomCon 2013! I haven’t shared any news with you for awhile. It’s been a crazy time in my office lately so I have a lot to catch up over the next few weeks. I’ve been on a motorcycle vacation in Florida, prepared for and attended RomCon 2013. Since I’m just home from RomCon, I’ll start there. It has nothing to do with the fact that I haven’t yet sorted out the vacation pictures. Well, maybe it does…just a little! I was incredibly busy these past few months preparing for RomCon 2013, an annual romance fan convention that took place in Colorado Springs, Colorado this past weekend. I’m a volunteer on staff and did my best to take care of the attending authors, organizing their schedules, etc. The last week before conference was N.U.T.S. Why is it that, no matter how long you’ve been working on a project — we’ve been working almost a year — there are millions of last minute things that still need doing at the eleventh hour? Thankfully, with a little bit of effort, everything got done. It was the best RomCon yet! Everyone I talked to, authors and readers alike, had a wonderful time. When I drove from Denver to Colorado Springs, I had a truckload just for the events I was involved with or organizing. I donated a Queen For A Day basket to be raffled off at RomCon. The proceeds from the baskets and giveaways donated is going to breast cancer research. RomCon collected more than $2,200 from the raffle, thanks to all of the readers who purchased raffle tickets! You’re the best! I didn’t get a photo of the reader who won my basket (pictured above), but I did get a chance to talk to her. I hope she has fun with the goodies I included: Earl Grey tea & European biscuit cookies for breakfast, a DVD of The Time Traveler’s Wife along with movie time popcorn for afternoon fun, some yummy smelling bubble bath along with a novel, my romantic comedy Satin Pleasures for evening enjoyment. There were candles and sparkling apple cider to sip from two champagne glasses and a vase of white silk roses filled with chocolates for bedtime. Everyone should have a day to pamper herself, don’t you think? I personally raffled off the candy dishes filled with chocolates (shown above) — and a special code to win a Kindle copy of Killing Secrets when it’s released on July 31 — to three readers who signed up at my Speed Dating and Autographing sessions. Thirty wonderful readers stopped by my tables to chat and sign up for the raffle. Nadia Holmberg, Joy Virgin, and Robin Martin each won one of the dishes. Joy was sightseeing and unable to pick up her dish so she generously told me to pick another name. I had to leave RomCon early to take someone to the airport so I’m not sure who ultimately won the dish. It was given away at the Sunday Reader’s Crown brunch. I also took a lot of swag for the readers who participated in the same events. I found the most delicious smelling bubble bath — 4 different flavors like Hawaiian Blossom & Plum and Bali Mango & Mandarin — to share with readers who played Super Sleuth and What’s My Story? with me. I envision a lot of bubble baths happening across the country in the weeks to come! When I arrived at the hotel on Thursday, a bunch of us spent a couple of hours stuffing these wonderful canvass bags for the over 300 attendees. We stuffed books, bookmarks, postcards, a water bottle, candy, and all sorts of wonderful swag attending authors had sent for registered readers. It was so full, we had to tie the handles to keep everything in. Does it get any better than SWAG? The goody bag also included our weekend program where I had an ad for my romantic comedy. No, it doesn’t get old seeing my book cover in public. Always a thrill! RomCon organizer, Michele Callahan, launched the convention Friday morning at breakfast. Yep, that’s me looking over my shoulder! Connected with some old friends from previous RomCon convention, and made some new ones! The first event I participated in on Friday was SPEED DATING. What F.U.N.!!!! It’s just how you imagine speed dating works in the dating world. Every couple of minutes, someone tells all of the readers to move one chair where they’ll spend the next two minutes talking to a new author. I met so many delightful readers…and they met me. 🙂 I was also fortunate to be sitting next to an author, Vicki Batman, who I’ve been Facebook friends with forever! It was wonderful to finally meet face-to-face. This was only the beginning of my schedule on Friday, and I have a lot more pictures and stories to share, so join me again on Thursday for more. I know, I know, tease, tease, tease! 5 Responses to Karen’s Killer Diary Drop-In ~ 06-25-13 ~ …And We’re Off To RomCon 2013! Yay! 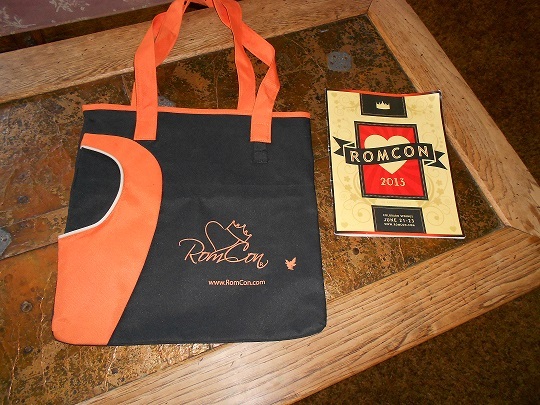 This year’s RomCon was the best yet! I can’t believe we have to wait a WHOLE YEAR for the next one! That much fun could not possibly be legal, so I’m glad we got away with it! Good thing it IS legal, Denise! I know you and I are not alone in looking forward to next year. 🙂 We have an entire year to prepare, bwahahahaha!